Tales of the City: Proof at last! 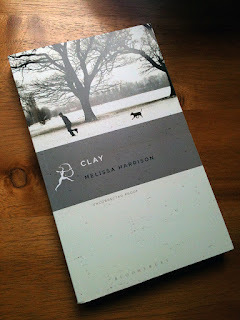 Proofs of Clay arrived last week, and they look wonderful. I'm over the moon to see the final image on them, as often proofs come in plain covers. The typography will be different on the real thing, though, which will come out in January. I took the picture a couple of years ago, on Tooting Common. The running figure is my husband, Anthony, and in my original photo the dog is Scout. But she's the wrong colour and shape for the dog in the book, a brindled Staffie called Znajda, so earlier this year I went out stalking Staffs until I found one that could be Photoshopped in. What's really amazing is that the main image was taken on an iPhone! Having worked in book publishing for several years, and then as a book reviewer, I was familiar enough with bound proofs to expect to feel rather blasé about my own. But in fact it felt very exciting to see Clay beginning to assume its final shape.